Recently, while working on my most recent Monster Index (MX6 Monster Index: Trolls), there was one thing that became more and more evident... there are so many kinds of trolls because they are so disposed to mutating (which is called out in a lot of articles on trolls, but almost as a throwaway line. So I started making a list of simple troll mutations that could almost act as a substitute for the Monster Index (applying a simple mutation or two to the standard troll). 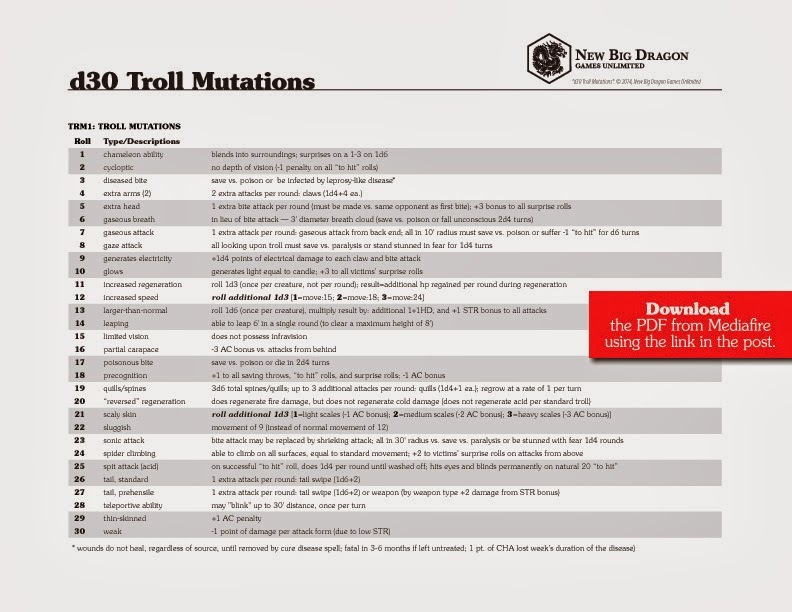 Which brings me to this week's d30 Feature... d30 Troll Mutations. I like the idea that even one troll from a group of trolls could be different from the others. It's easy to say that a mutated troll who is stronger than others might be the group's leader (for an in absentia female troll chieftain). But what if the troll has a "weakness" (e.g., is cycloptic, or is the runt of the group). What's that relationship like? How does he fit into the context of a group where every member is stronger/better than him? To me, this chart isn't just a list of monster variations, it's a chance for storytelling. d30 Troll Mutations from MediaFire. A few weeks ago, I put forward some thoughts concerning my thinking for working psionics into BX/LL. The goal was to make the rules familiar and easy to grasp, and attempt to put into into terms and mechanics that are fundamental within the game (as opposed to OD&D and AD&D psionics, where are an entirely separate system "frankensteined" onto a dissimilar system). 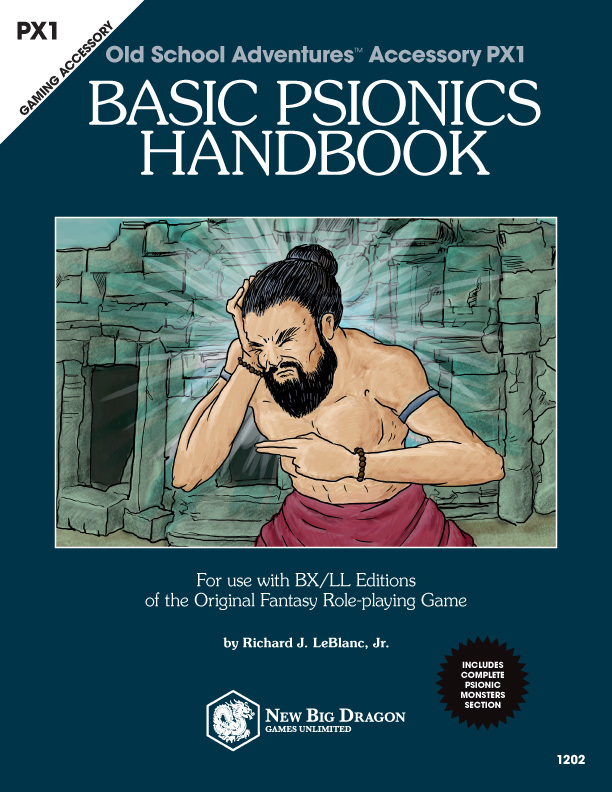 The keystone to making the system seem familiar (for BX players who need to quickly "get" how a psionic system can work easily with their system) was the idea of incorporating a mental class (MC), and rolling “to hit” with psionic attacks. This would be for psionic-vs-psionic combat only, though; "to hit" rolls are not needed vs. non-psionics, but non-psionics do get a saving throw based on their INT and the range of the attack (this is actually something that comes from OD&D). 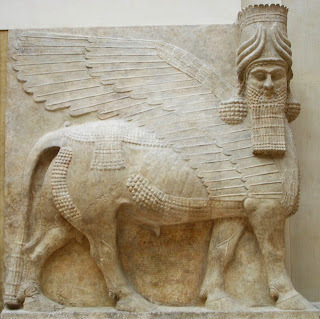 As for MC, I see it being based on the defender's intelligence and their level as a psioncist. There would be a separate attack table for psionic attacks based on attacker's psionic level and defender's MC (and it would look just like a standard attack table). Also, combinations of attack and defense modes would just affect the defender's MC while in that mode (e.g., if an attacker were to use an Ego Whip attack vs. a Mind Blank defense, the defender would suffer a +5 MC penalty against that attack). In this model, any monster with psionic powers would have to be given a psionic level specifically for psionic attacks/defense (in addition to its normal HD/AC, which would still be used for determining physical attacks). This BX system would still need some sort of "psionic energy points" in addition to level determination. I'm probably going to take a cue here from the 2e psionicist, with each level giving the psionicist about 10 additional energy points (give or take a few based on WIS). Using this standard, a monster like the 1e shedu with a psionic ability of 70-100 would attack defend on mental attacks as a 7th-10th level psionicist (which seems about right for a 9+9 HD monster). The su-monster, on the other hand, while only having 5+5 HD, would attack as a 12th level psionicist (since it has a psionic ability of 120). 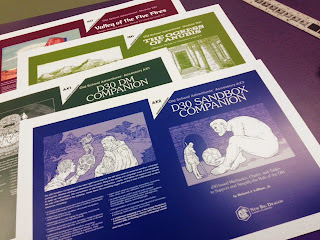 Ultimately, my goal is to be able to quickly convert 1e psionic information (particularly for monsters) into a simple to use BX system (that could be handled in less than a dozen or so pages). 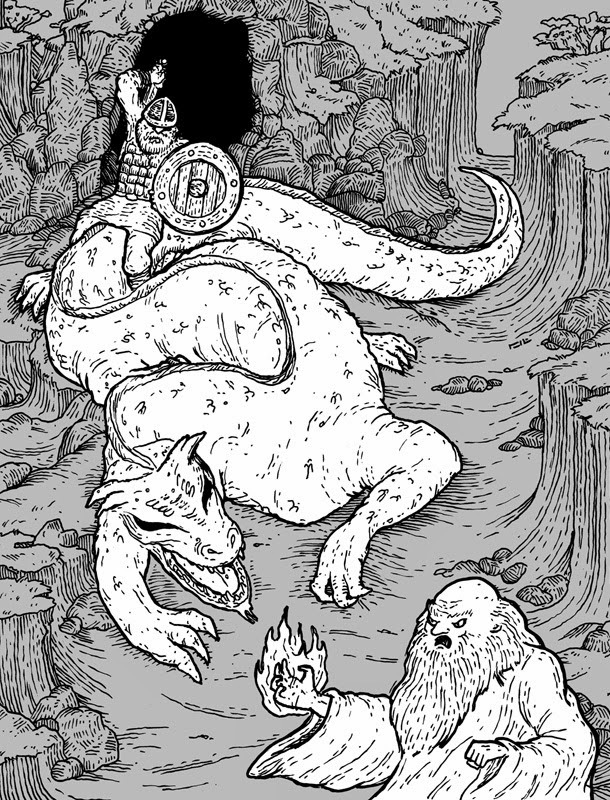 When I launched The Dragon Horde zine with its inaugural issue, I made a commitment to myself to have as much of the zine's content as possible appear in the zine exclusively (if not as its only appearance, at least as its first appearance). With my work schedule as of late, it's been tough to maintain regular blog posting in addition to the "behind the scenes" work on the next issue of the zine. 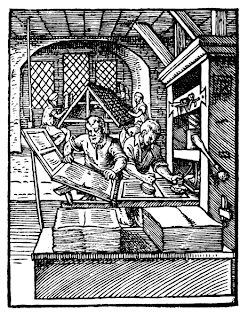 While the zine is coming along nicely, I feel like this blog (my first baby) is being neglected. 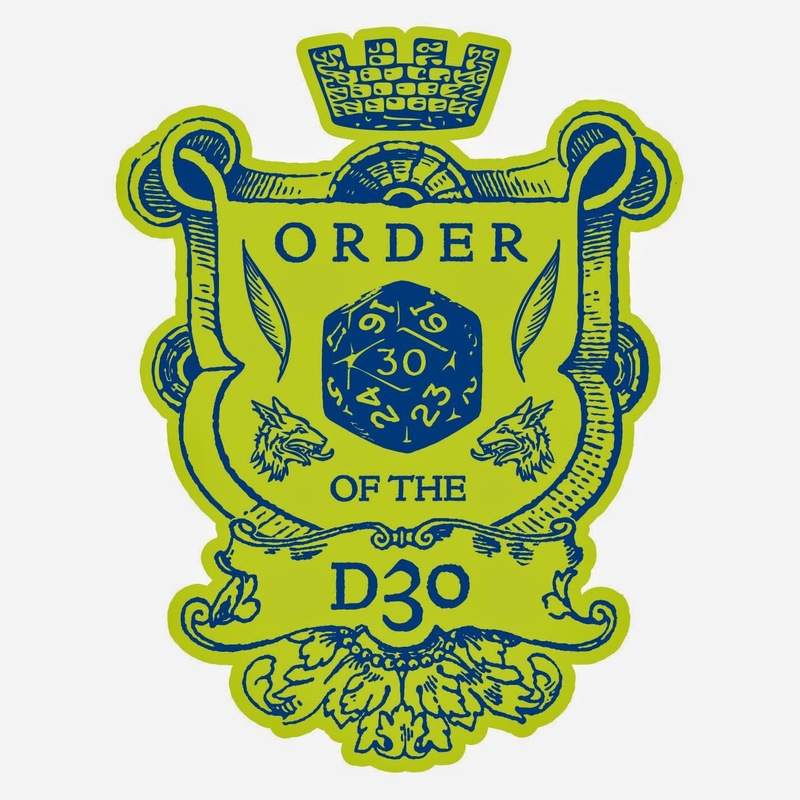 I'm going to do my best to post every day this week, including a free adventure on Thursday (which has been written for weeks, but just needs a hair of tweaking), and a new d30 chart on Friday (again, something that's mostly complete, but has been sitting around waiting to be laid out). Over the weekend, I did make some really good progress on the zine. I finished an article on Viking longhouses (which supports the adventure in the issue). (since wights are part and parcel of Nordic/Viking-themed adventuring). I've added some new magic items. The House of the Wolfings, and turns them into sandbox fodder (giving some overview information on each group, and listing a few notable NPCs from the story). It's about 1/2-done. I made some progress on the rune-based adventure seed generator. And, yes... beginning with issue #2, both issue #2 and back issues of #1 will be available in print through my new Square storefront. Wait— did I mention my new Square storefront? Then I'll talk about that tomorrow. Monster Roster: Linnorms. I know this is a creature that has been dealt with in a few places (e.g., 2e's AD&D Monstrous Compendium Annual 1, John Turcotte's Stormcrows Gather. I felt like 2e's linnorms were too strong, and Turcotte's linnorm really only came in one variety. I wanted the variety of 2e, but executed with more of a BX vibe (even though Oe/1e stats will be included). The Völva: A New NPC Character Class. Honestly, the way I've done this one up, there's no reason it doesn't work as a PC character class. I've seen other people mention they'd like to see this as a class for a Nordic/viking-themed RPG, but haven't found anyone working it up (especially for old-school D&D editions and clones). Vifillmein. This is the issue's adventure designed for beginning level (1st=3rd) characters. I'm feeling pretty good about the concept, and the presentation (even though I do have a lot of work left to flesh out the bones). A Futhark Rune Adventure Seed Generator. It's based on the actual meaning of the runes, and the various methods used to draw them from the bag. I'm really trying to make this substantially different than the adventure generator from the d30 Sandbox Companion, and keep with the spirit of the runes used as predictions (things for the DM to aspire to, rather than design around, as the adventure goes on). I'm feeling pretty good about it so far, and the "bones" of the system are in place. Mostly, I've just got to get runes broken out to match the dice rolling (trying to keep it completely d6-based). There will be some other, smaller articles (about a half-dozen or so). But, like I said, these are the main anchors of the issue. This is a sketch for the adventure I've got in the works for Dragon Horde Zine #2... for which I shared the illustration recently. 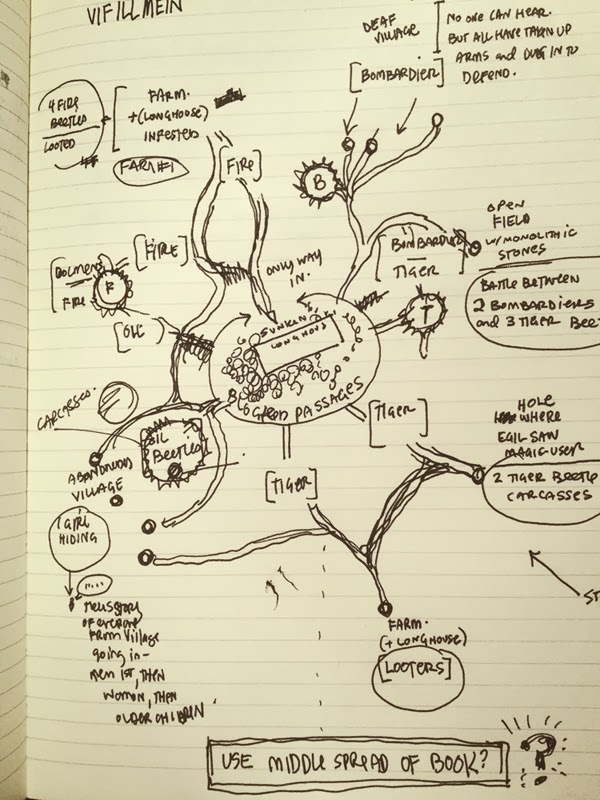 There's actually a lot of story going on here that's not obvious from that illustration or this sketch (which really does nothing more than lay out the major encounter areas, and note how they're related). The story does, however, drives the whole thing. In some ways, the way I'm approaching adventure design as-of-late is based on a technique I'm calling the "shreds of fabric" technique. Hah! I just made that up. Look, if Hemingway could use an "iceberg" approach to storytelling, why can't I use a "shreds of fabric approach." Okay, I'll admit, "shreds of fabric" is just my way of saying that little clues are planted here and there, and as more shreds of fabric and placed to together, the clearer the picture becomes of what really happened. I know that's not really a new technique (and those writing professors out there will probably chime in with a more appropriate term for the technique), but it does help me think about how I want the story to be woven as the characters progress through the encounters, regardless of the order of those encounters. I'm reminded of the movie The Sixth Sense. Somebody had warned me not to read too much about it before I saw it, because of the big plot twist at the end. Because I knew there was a twist, when I saw the movie for the first time, I started looking for it. Halfway through the movie, I figured it out. Watching the rest of the movie just reinforced my hypothesis. So when the twist was finally revealed at the end, I thought to myself, "Yep. I figured it out." But it didn't necessarily reduce my enjoyment of the story. I'm hoping this adventure is the same. That even if the characters discover the "plot twist" (i.e., get the "whole picture") halfway through the adventure, that it doesn't keep them from enjoying the other little shreds of fabric as they discover them. 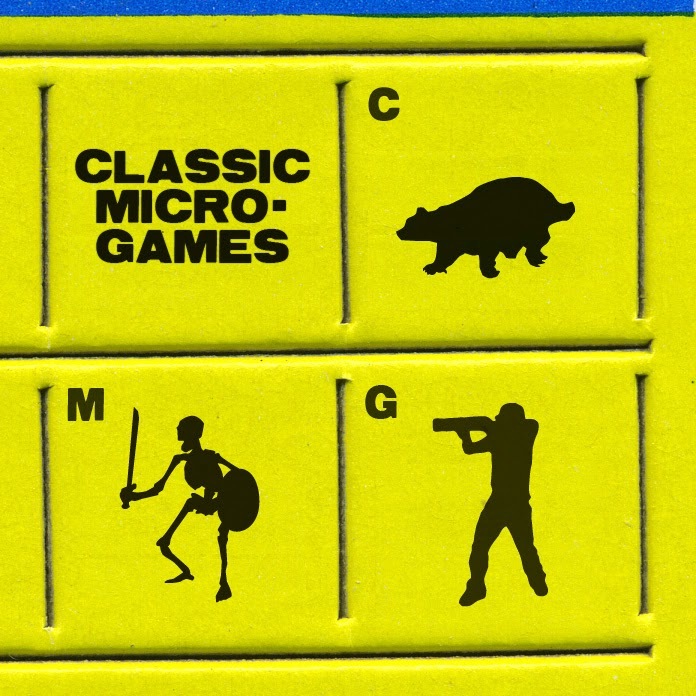 I've just started a new Google+ community dedicated to classic microgames (think small boxes and zip bags) popular from the late 70s through late 80s, as well as to the support and development of new games in the same vein. Membership is open. Please join if this interests you! The original mechanic was based on a number of d6s rolled equal to the chit's Attack Rating (from 1d6-4d6), both sides rolled, and the difference was subtracted from the lower roller's Wound Points as damage. This was repeated until one of the two combatants was dead. While it seemed good in theory, in practice it was... well... it just wasn't fun. Weaker opponents died pretty much 100% of the time, regardless of whether the advantage was 4d6 to 3d6 or 2d6 to 1d6. The reworked mechanic was based on a 2d6 roll on an odds table (like the ones on this post, but with 2d6 instead of 3d6), and a separate damage roll (based on the result of the 2d6 roll). At first glance, it would seem that 2 rolls per "round" would be more confusing and take longer than 1 roll per "round," but not so. It was smoother, much more balanced, and makes even the 1d6-Attack-Rating Skeletons potentially deadly (but mostly "potentially"). Given the deadliness of even minor encounters under the new combat paradigm (yes, I used the word "paradigm," what of it? ), the Wound Points (i.e., "hit points") for all the animals, monsters, and warriors (player and NPC warriors alike) had to be re-thought. In most cases, their Attack Ratings stayed the same, and only the Wound Points were adjusted (usually down by about 1/2) so that combat resolution didn't take forever. Originally, winning the game required only acquiring all four of the Luuzhin coins. The updated victory condition requires the player make it back to their base camp to return the acquired coins to their Khan (the player parties are searching on behalf of their respective khans). This creates a bit of a gauntlet during the last moments of play, and creates some extra tension. Somebody asked the playing time. I think given the most recent experience, whether you're playing with 2, 3, or 4 players, I'm thinking about 2 hours. Ironically, having more players potentially shortens the game time, while fewer players means it could take longer. With a certain number of spaces on the board that have to be investigated, more players means investigating them goes more quickly. And fewer players means investigating them goes much slower (duh). At this point, I just need to retype the rules to accommodate all the little tweaks we've made along the way, as well as the re-figured combat rules. I'm not quite ready for volunteers yet, but give me a week or so, and keep your eye on this blog. Most likely, the next post I make about the game will be the call for beta playtesters, and I'll tell you what/who we're looking for, and how we'll choose. Welbo and I will probably run a few sessions via Roll20 (with 2 recruits per session), but we'll also likely be sending out some "prototype" versions to a few others (for blind play, without our assistance with the rules). This is the image for the title page of the adventure for the issue. 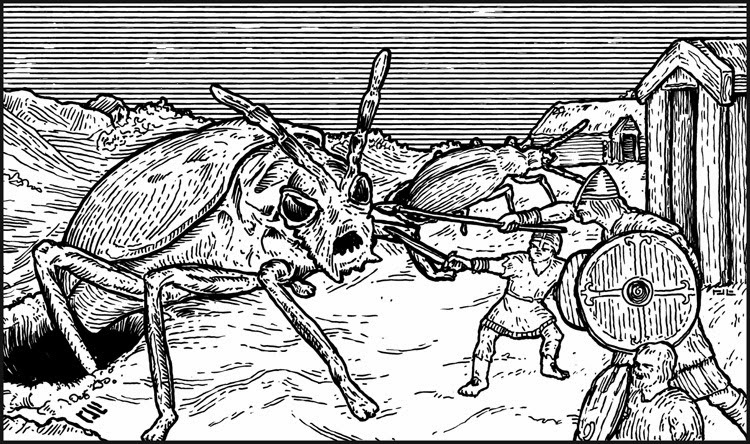 The adventure is tentatively titled Vifillmein ("beetle plague"). BTW, I'm not sure why I love putting halfings in my illustrations. I just do. No... "völva"... with an umlautted "o" (not a "u") - a Norse shaman/seeress. 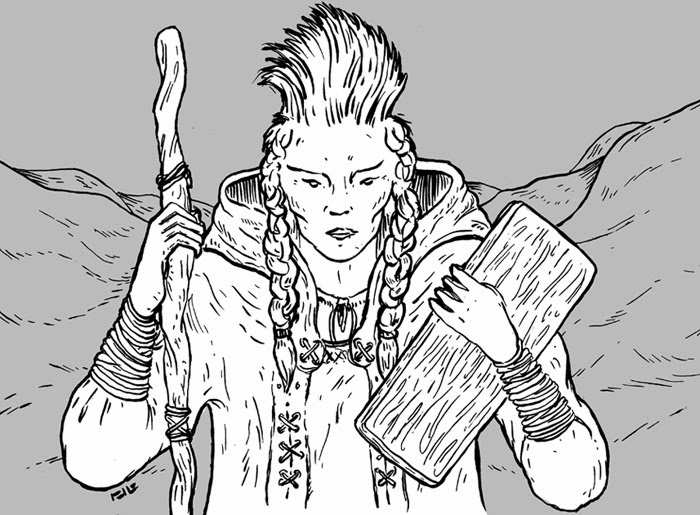 It's an NPC character class I'm working on for issue #2 of The Dragon Horde zine. I was really looking for an old public domain illustration from the lat 1800s or early 1900s that would fit the bill, but to no avail. In lieu of that option, I decided to do my own. My first stab (bottom) was really an attempt to start using my brush pen again. While I like the line quality, it just didn't have the visual punch I wanted (and felt a little to "new school" for what I wanted visually, especially the punkish haircut). 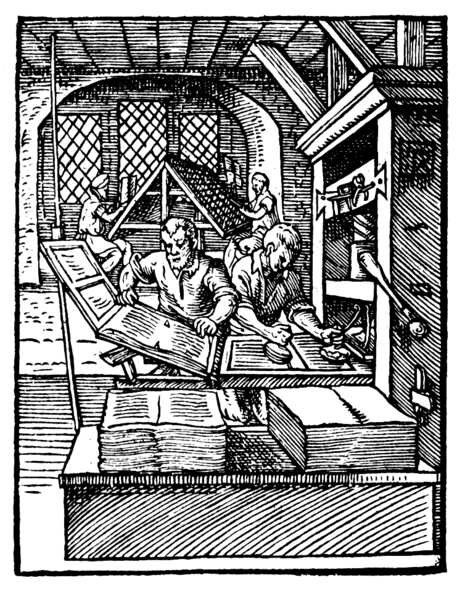 So I took another stab, attempting to give it that woodcut inspired look with which I've had some success (see my Bartleby illustration for reference). The new illustration makes her look older, but that's intentional. 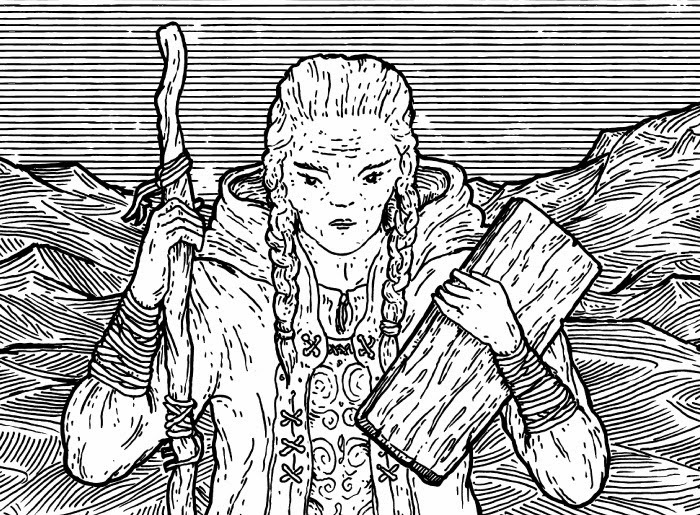 The further I got into the development of the class, I realized making her a tad older made more sense (and was more in line with the traditional image of a völva).